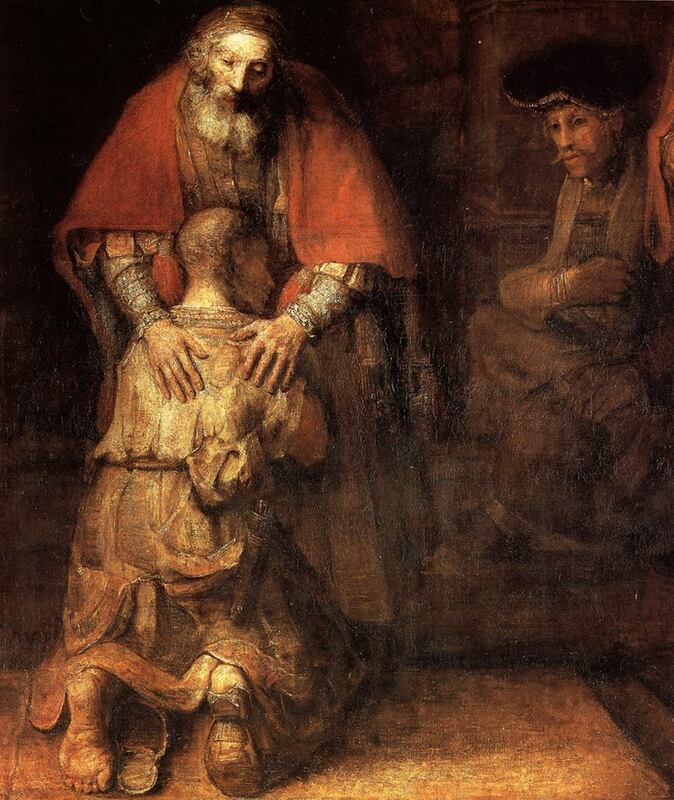 A few years ago, I developed a talk on Rembrandt’s Return of the Prodigal Son, so I am taking advantage of this Year of Mercy to give the talk as much as I can. I have found that the painting offers an excellent way to unpack the beauty of Christ’s famous parable about God’s infinite love and mercy. Every time I give the talk, there is always some detail that strikes me in a new way. Most recently, it has been the way in which the prodigal son’s head rests in the bosom of his father. There is something very peaceful about it. After so much time spent desperately seeking security and meaning in the fleeting attention of the world, the prodigal son has finally returned to his father and to the paternal love that was always there for him. With this beautiful image, Rembrandt gives us an icon of the peace to which each of us is called. Like the prodigal son, we are all allured by what the world has to offer us. We all yearn for attention and love, and all too often we enslave ourselves to the unrealistic expectations of others as we search for this love and attention. Just as the prodigal son ran off to a faraway city, so do we flee to the virtual cities of TV and the internet to gaze at the dazzling riches and pleasures awaiting those whom the world favors. We watch the lives of celebrities and frustrate ourselves longing to be as loved and appreciated as them. We dissipate our time, energy, and peace striving to somehow get our own scraps of fame and recognition. We model ourselves on those famous people and spend too much time and money trying to look like them. All the while, God the Father is waiting for us with arms wide open. The love that we desire so much is actually available with unimaginable intensity in God. The love of the world is always conditional and fickle, but God’s love is infinite and eternal. It is very important to rest in God’s love. We need to form the habit of withdrawing our thoughts and imagination from the distractions of the world and instead focusing on God. We have to allow ourselves to bask in his love for us. This requires time, but it will always be time well spent. Even if it is only 15 minutes a day spent in prayer or reading of Scripture or sitting before the Eucharist, God will respond generously to our efforts to rest in him. Lent is a time to disconnect from distractions and to rest in God. Take advantage of these last few weeks of this holy season to ensure that you are spending time daily to calmly rest in the beauty and love of God the Father.